Ira Marshall Claybourn was born on 1 October 1882, in Jefferson County, Illinois. He married (1st) Maude E. Long on 15 April 1904 in Trinity, Texas. [Maude Long was born on 8 September 1886 in Trinity, Texas.] They had five children together, listed below, but Maude died on 6 April 1919 while all of the children were still young. Ira married (2nd) to Nancy Narcissus Garnett (“Nannie”), a nurse, on 27 January 1923. [Nancy Garnett was born on 1 March 1890 in Whitehouse, Texas.] It was Nancy who really reared the children. Ira worked with the Missouri Pacific Railroad (and its predecessor International – Great Northern Railroad) as a brakeman from 1903 until his retirement forty-five years later. 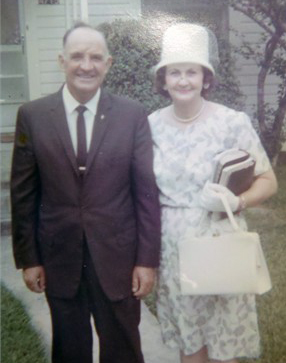 He lived primarily in Mineola, Texas, and was a member of the First Baptist Church. Ira died on 18 April 1967. Nancy died on 27 June 1974. They are buried in Cedars Memorial Gardens Cemetery in Wood County, Texas, along with his first wife. Ethelyn Claybourn was born on 15 January 1907 in Trinity, Texas. She married Thelbert Ray Herndon and they had no children. [Thelbert Herndon was born on 28 September 1900.] Ethelyn was a registered nurse who worked at Baylor Hospital and lived in Dallas, Texas. She died very suddenly on 14 December 1956 of cerebral hemorrhage and is buried in Mount Carmel Cemetery in Wolfe City, Texas. Thelbert later married Louise M. Williams, then died on 12 January 1982. He is buried with Ethelyn. 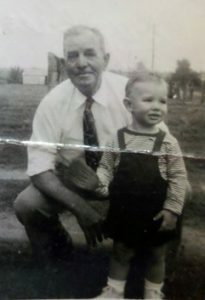 Wayne Claybourn was born 26 December 1907 in Palestine, Texas. As an infant he had a severe case of cholera infantum. 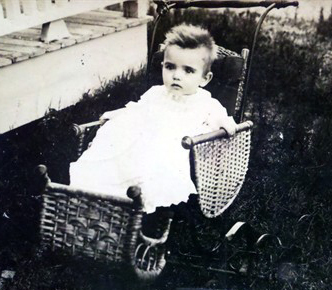 On 13 July 1908 his mother wrote a postcard to family indicating that she feared she would lose him to the illness and thus took his picture, featured below. Wayne was a switch man for Southern Pacific Railroad and lived in Houston, Texas. On 15 June 1935 Wayne married Myrtle Altoria Brown of Mineola, Texas. [Myrtle Brown was born on 21 December 1921 in Golden, Texas, to Charles Edward Brown (1866-1943) and Susie Jane Keaton (1885-1965).] They had four children together, listed below. Wayne and Myrtle relocated to Cedar Hill, Texas, in 1995. Wayne died on 5 May 1999 and Myrtle followed in death on 8 November 2001. Betty Joan Claybourn was still born on 12 April 1937. Kathryn Sue Claybourn (“Sue”) was born on 3 December 1939 in Houston, Texas. She married Richard L. Smith on 14 August 1960. They lived in Omaha, Arkansas, and had two children together. Richard was employed by Lone Star Steel and the couple also managed an eight acre farm. The two relocated to Houston, Texas, and then Tyler, Texas. Steven Wayne Smith was born on 15 September 1962 in Harris County, Texas. David Lee Smith was born on 8 June 1965 in Harris County, Texas. He worked as a missionary in Taiwan. Later he lived in Santa Ana, California. He married Gayle Elisabeth Bradshaw (born in 1965 in Upshur County, Texas) and the two had four children together, listed below. Taylor Lee Smith was born on 18 February 1990 in Travis County, Texas. Alexa Lauren Smith was born on 20 April 1993 in Brazos County, Texas. Nathan Bradshaw Smith was born on 20 September 1996 in Brazos County, Texas. Gabriel Thomas Smith was born on 27 September 2000. Jerry Ray Claybourn (“Ray”) was born on 2 October 1942 in Houston, Texas. He married (1st) to Lounell Lynn Wuensche (born in 1946 in Galveston County, Texas) on 31 July 1965 and they had one child, Keri. Ray and Lounell divorced on 23 July 1982 in Harris County, Texas, and Keri lived with her mother. Ray married (2nd) to Marian Delyce Knetig (born in 1946 in Nuences County, Texas) on 24 December 1988 in Montgomery County, Texas. Keri Lanette Claybourn was born in 1973 in Harris County, Texas. She married Wade C. Jaynes (born in 1972 in Los Angeles County, California) on 30 May 1993 and the two divorced on 23 November 1999 in Montgomery County, Texas. Janis Claybourn (“Jan”) was born on 17 September 1948 in Houston, Texas. She married on 21 January 1967 to Cyril Julian Garner Jr. (born in 1947 in Harris County, Texas). Together they had one daughter, listed below. Jennifer Denise Garner was born on 18 March 1968 in Harris County, Texas. She married (1st) on 20 June 1986 in Harris County, Texas, to Frank Wendelin Piper III (born in 1960 in Harris County) and together they had two boys, Trent and Brandon, listed below. Jennifer and Frank divorced on 31 July 1989. Jennifer married (2nd) on 16 September 1989 in Dallas County, Texas, to Forrest Darrin Slaughter (born in 1968 in Jefferson County, Texas). Together they lived in Midlothian, Texas, and had one daughter, listed below. Trent Adam Piper was born on 30 January 1986 in Harris County, Texas. He married (1st) to Mary J. Dooley (born in about 1986) on 22 October 2005 in Dallas County, Texas, and they divorced on 1 June 2007 in Taylor County, Texas. He married (2nd) to Stephanie Rachel Kennedy (born in 1984 in Dallas County, Texas) on 13 November 2010 in Tarrant County, Texas. Brandon Anthony Piper was born on 27 May 1987 in Harris County, Texas. He married Chelsea D. Smith (born in about 1989) on 27 July 2010 in Harrison County, Texas. Brandon served in the Air Force and was stationed in Louisiana for a period of time. Tarah Janice Slaughter was born on 28 December 1990 in Tarrant County, Texas. Seawell Claybourn was born on 28 June 1909 in Mineola, Texas. 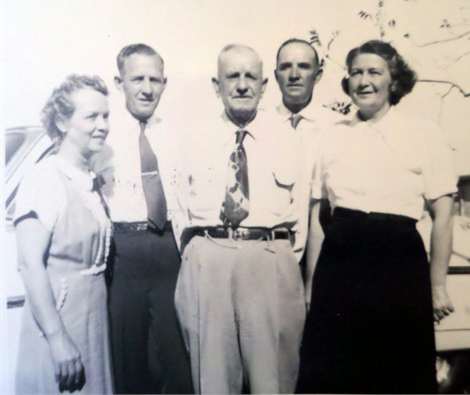 He worked in Mineola as a car inspector for the Texas-Pacific Railroad. 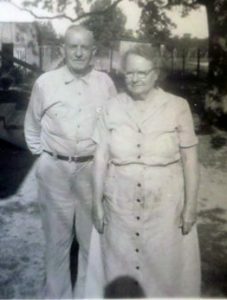 He married Thelma Mildred Hardy (born on 20 March 1914 in Bowie County, Texas), who worked as a licensed vocational nurse. Together they had one child, listed below. Seawell died of cancer at Baylor Hospital in Dallas, Texas, on 12 June 1974, just two weeks before his retirement. Thelma died on 27 May 2005 in Tyler, Smith County, Texas. They are buried in Cedars Memorial Gardens Cemetery in Wood County, Texas. Nelda Yvonne Claybourn was born on 19 April 1935 in Wood County, Texas. She married Johnie Coleman Henderson (born in 1931 in Wood County, Texas). They lived at Grand Saline, Texas, and had two children, listed below. Pamela Yvonne Henderson was born on 13 January 1957 in Smith County, Texas. She married on 9 December 1995 in Wood County, Texas, to George Dennis Wilks Jr. (born in 1962 in Fanin County, Texas), who was previously married. Susan Gail Henderson was born in 1961 in Smith County, Texas. She married on 25 April 1984 in Wood County, Texas, to James Darryl Lee (born in 1960 in Harris Co, TX). Jennifer Delayne Lee was born in 1989 in Smith County, Texas. Jacquelyn Deanne Lee was born in 1994 in Smith County, Texas. Juanita Claybourn was born on 21 August 1910 in Mineola, Texas. In about 1937 she married Ross Worth Jones and lived in Dallas, Texas. [Ross Jones was born on 20 July 1910 in Mineola, Wood County, Texas.] They had four children, listed below. Juanita worked for at least a while as a sales clerk at a variety store. She died on 14 April 1969. Ross died on 21 May 1975. They are buried in Restland Memorial Park Cemetery in Dallas County, Texas. Curtis Lynn Jones was born on 10 June 1938 in Mesquite, Texas. He lived in Dallas and married on 21 December 1957 to Janie Fern Cornish in Pilot Point, Texas. [Janie Cornish was born on 22 July 1939 and was a Jehovah’s Witness.] They had four children, listed below. [Information about Curtis Lynn Jones is based upon correspondence between Jennifer Lynn Jones Buzzaird, a daughter to Curtis, and Joshua Claybourn in March 2010.] Curtis died on 8 January 2000 in Travis County, Texas. He is buried in the Odd Fellows Cemetery in Williamson County, Texas. Curtis Michael Jones was born on 6 January 1959 in Dallas, Texas. Curtis died on 30 October 1994 in Missouri. He is buried in the Odd Fellows Cemetery in Williamson County, Texas. He had no children. Jana Michelle Jones was born on 27 September 1961 in Dallas, Texas. She married on 30 September 1978 in Dallas County, Texas, to Dean Scott Jones (born in 1957 in Tarrant County, Texas). She had three children, listed below. Jeffrey Dean Jones was born on 29 August 1981 in Dallas, Texas. Samuel Weylin Jones was born on 6 February 1987 in Dallas, Texas. Lisa Michelle Jones was born on 5 October 1988 in Tarrant County, Texas. She married Russell Bennett on 7 February 2009. Lori Elaine Jones was born on 17 September 1963 in Dallas, Texas. She married on 30 December 1982 in Williamson County, Texas, to Euell Edward Campbell (born in 1961 in Williamson County, Texas). They resided in Georgetown, Texas, and had two children, listed below. Christina Lauren Jones (“Lauren”) was born on 27 December 1985 in Round Rock, Texas. She attended Baylor University and University of Mary Hardin-Baylor and worked for a time with a preschool. She married on 25 February 2008 to Justin Rowdy Caskey (born in 1983 in Travis County, Texas). Together they had three children: (i) Ryland Bentley Caskey, born on 29 August 2008, (ii) Jaxon Wake Caskey, born on 17 September 2010, and (iii) Lila Catherine Caskey (“Lila Cate”). Christopher Ryan Jones was born on 19 January 1989 in Travis County, Texas. Jennifer Lynn Jones was born on 23 July 1973 in Austin, Texas. She married (1st) on 5 September 1992 in Williamson County, Texas, to Marvin Ray Votruba Jr. (born in 1971 in Lampass County, Texas). They had one son, then divorced on 21 December 1994 in Travis County, Texas. Jennifer married (2nd) on 22 July 1995 in Williamson County, Texas, to Michael Arthur Brown (born in about 1968). They had two children, then divorced on 28 February 2003 in Harris County, Texas. She later married (3rd) to Orville Ernest Buzzaird Jr. (born on 20 February 1959 in Bexar County, Texas). He had two previous marriages (to Sandra from 1978 to 1986, and to Cheryl Ann Albright from 1987 to 2008). He and Cheryl had two children, Kymberley Rene Buzzaird in 1989 and Jesse Aaron Buzzaird in 1992. Zachary Tate Votruba was born on 2 September 1993 in Travis County, Texas. Michelle Ashley Brown was born on 10 April 1996 in Travis County, Texas. Justin Matthew Brown was born on 24 April 1998. Ira Worth Jones was born on 29 July 1943 in Longview, Texas. 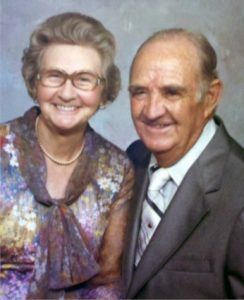 He married Dovie Lavonne Fowler (1948-1999) on 20 January 1968 in Dallas, Texas, had one son together but they divorced on 17 October 1975. Philip Donovan Jones was born in 1968 in Dallas County, Texas. He married on 6 January 1990 in Collin County, Texas, to Marcia Gail Blaha (born in 1963 in Harris County, Texas). They had at least two children. Kathryn Paige Jones was born in 1993 in Brazos County, Texas. Lauren Elizabeth Jones was born in 1996 in Harris County, Texas. Carol Ann Jones was born on 27 October 1944 in Longview, Texas. Mary Frances Jones was born on 14 October 1947 in Longview, Texas. She married on 27 January 1968 in Dallas County, Texas, to Johnny Earl Gray (born in about 1947). They had a son and later divorced on 24 August 1981 in Dallas County, Texas. John Worley Gray was born in 1975 in Dallas County, Texas. Ira Marshall Claybourn, Jr. was born on 2 January 1912 in Mineola, Texas, and died at the age of three on 29 April 1915.